The peak of the 2018 summer movie season has passed us. 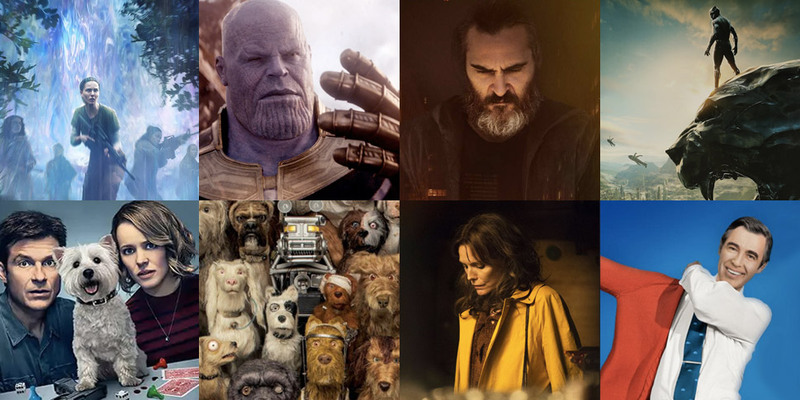 Some in the cinema world have begun staring deep into the horizon for the expected annual onslaught of Oscar contenders that seek to attract awards voters throughout autumn and winter. Before I even consider doing that, I would like to take a moment and consider the first half of cinema in 2018—the highs, the lows, and the green. 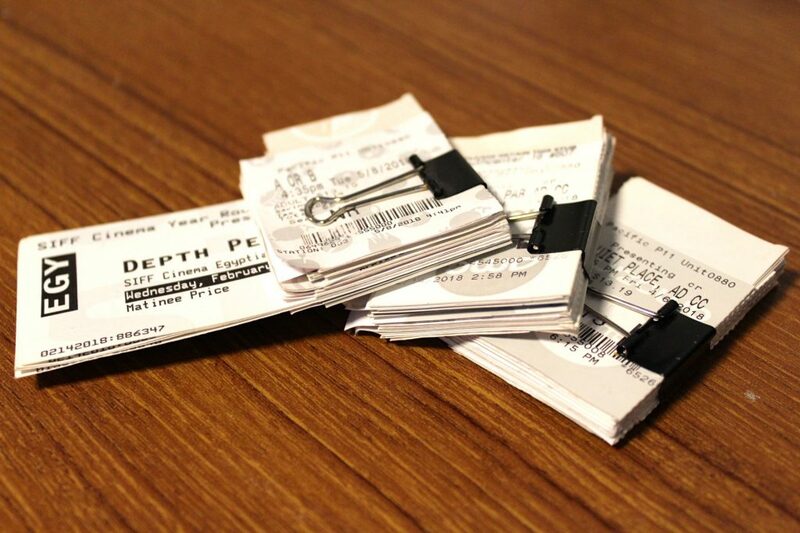 Around the start of 2017, I made a personal oath: For the rest of my life as long as I am physically able, I will watch at least 200 new releases per year, in the theater. I will watch 100 new releases before the end of June to ensure that I make that goal. With just two days left until July, I reached that mid-year checkpoint with Breath, an adaptation of the 2008 novel by Tim Winton (who co-wrote the script with Gerald Lee and actor-director Simon Baker). I do not expect to surpass the 240 or so new releases I saw last year, but I should manage to reach my goal of 200 new releases by the end of December. At this point last year, I regarded Kong: Skull Island and T2 Trainspotting as my two favorite films of 2017’s first half. In my top 10 for 2017, Kong ended up in 5th and T2 in 3rd. I suspected, as I was writing last year’s mid-year report, that I had yet to encounter my ultimate favorites of 2017. 2018 has been the opposite so far. Instead of predicting better movies to come, I wonder if cinema in 2018 has already peaked. Such is the takeaway when I survey my current top five for the year (in alphabetical order). A loose adaptation of the 2014 novel by Jeff VanderMeer, Annihilation (trailer) set an impressive standard for cinema in 2018 upon its release in late February/early March (theatrically in North America and China; the rest of the world got it on Netflix). Writer-director Alex Garland guides the all-female main cast (anchored by a sturdy Natalie Portman) through a tense and cerebral sci-fi journey, aided by mesmerizing technical crafts and a few pinches of traumatizing horror. Count me as one who now prefers it over Ex Machina, Garland’s 2015 directorial debut. From one directorial sophomore effort to another: After making their directorial debut with the abominable 2015 “comedy” Vacation, directors John Francis Daley and Jonathan Goldstein surprised this year with the ensemble black comedy Game Night (trailer; also Ben Escobar’s review). Though Mark Perez handled the script (for which I would shower Perez with Best Original Screenplay awards right now if I could), that Daley and Goldstein followed up the atrocity that was Vacation with this astounds me. The cast is fantastic and well-balanced, with Jesse Plemons as the standout. The sharp editing enhances the comedy, while the score by Cliff Martinez injects the right dose of nervous adrenaline. Finally, cinematographer Barry Peterson pulls off my pick for 2018’s best long take (“Pass the Egg”). Nine years after 2009’s Fantastic Mr. Fox, writer-director Wes Anderson returns to stop-motion animation with the Japanese (specifically Akira Kurosawa)-inspired Isle of Dogs (trailer). Even after six viewings, I remain awe-struck by Anderson’s ever-tightening visual style (so much symmetry!) and the playful technical efforts at work to achieve it, including (but not limited to) Anderson’s growing stable of actors, the meticulous animation supervised by Mark Waring, and a driving and memorable score by Alexandre Desplat. Do not let the language and cultural differences prevent you from experiencing this stop-motion animated delight. The Oscars are due for another animated Best Picture nominee. That, however, is not enough for Isle of Dogs. To the Academy’s directing branch: It. Is. Time. Time to finally nominate an animated film for the Best Director Oscar. 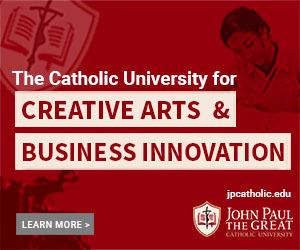 Please do not let this opportunity pass you by. Ask me of my current pick for the best acting performance of 2018 and I will say, “Michelle Pfeiffer in Where Is Kyra?” (trailer). This underrated drama from Nigerian-born director Andrew Dosunmu is utterly spellbinding. Bradford Young’s brooding cinematography would have compelled the late Godfather cinematographer Gordon Willis (a.k.a. “The Prince of Darkness”) to stand up and cheer. Few big-screen releases in 2018 stand a chance of embodying the term “hidden gem” like Where Is Kyra? Rounding out my current top five for 2018 is the brutal arthouse thriller You Were Never Really Here (trailer), the latest work from Scottish filmmaker Lynne Ramsay. Ramsay’s take on the 2013 novella by Jonathan Ames boasts a masterful lead performance by Joaquin Phoenix. The overbearing sound design that reflects the PTSD of Phoenix’s character pairs nicely with Jonny Greenwood’s low-key yet superb electronic score. Ramsay’s film never overstays its welcome and encourages repeat viewings to catch and marvel at its meticulous details. Films that draw my ire not only demonstrate ineptitude in cinematic storytelling, but disgust me with their vulgarity and unearned, moronic, or just plain wrong takeaways. One new release so far in 2018 firmly lands in the overlap of that Venn diagram. I detest Blockers. I detest how it presents high school girls on the prowl for prom night promiscuity as “empowering” for females. I shake my head in disbelief at its clueless main trio of parents (an okay Leslie Mann, a hit-or-miss John Cena, and an insufferable Ike Barinholtz) who ultimately relinquish any and all responsibility over their kids with regards to approaching sexuality. Blockers’ horrendous outlook, feigned intelligence, and misplaced empathy are all garbage. The movie makes me sad for the culture today. It is easily one of the worst excuses for comedy this side of 2000. Just outside my bottom five, I would like to give a dishonorable mention to Let the Sunshine In. Despite the reliable presence of Juliette Binoche, writer-director Claire Denis’ French romantic comedy is 2018’s poster child for dull and pointless European arthouse cinema. As of the start of July, Black Panther leads the domestic box office (i.e., U.S. and Canada) mere millimeters short of $700 million. Avengers: Infinity War leads the worldwide box office as it nears $2.05 billion (having become only the fourth member of the “Two Billion Dollar Club”). 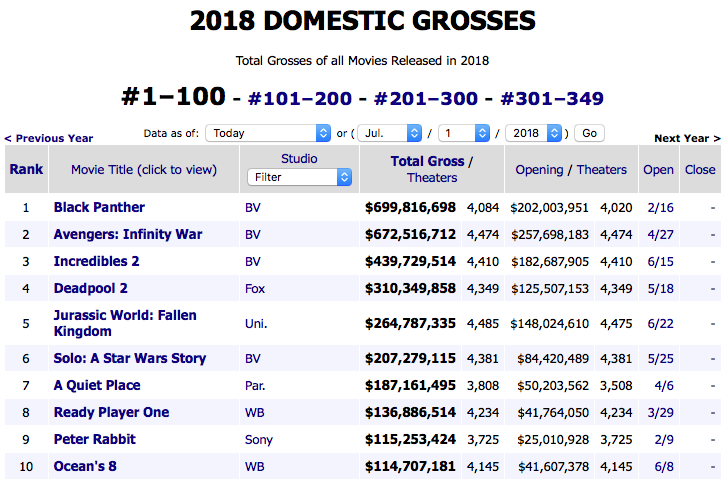 The two Marvel Cinematic Universe entries switch positions between the two lists: Domestically, Infinity War trails Black Panther by just over $20 million. 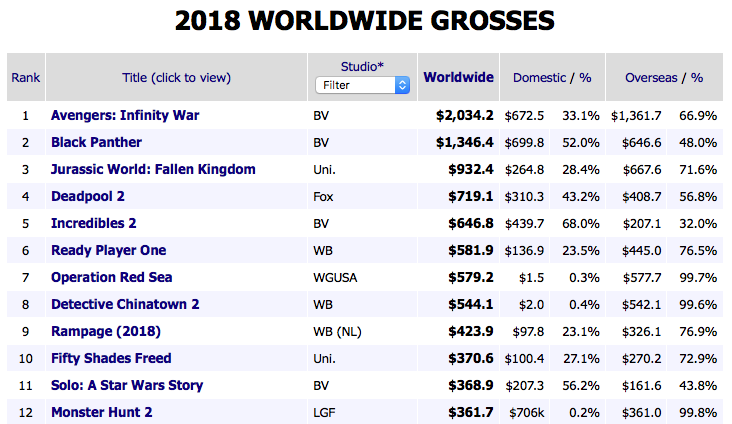 Worldwide, Black Panther trails Infinity War by around $700 million. Judging by the release schedule for the rest of 2018 and with Solo: A Star Wars Story (under $215 million domestic, under $400 million worldwide) having come and gone, I make the following prediction: Black Panther, Avengers: Infinity War, Jurassic World: Fallen Kingdom, and Incredibles 2 will end up as the only new members of the “Billion Dollar Club” (i.e., films that have earned at least $1 billion worldwide) from this year. As always, we must wait and see. Here’s to a stronger second half of cinema in 2018! For more articles and reviews by Renard, click here.